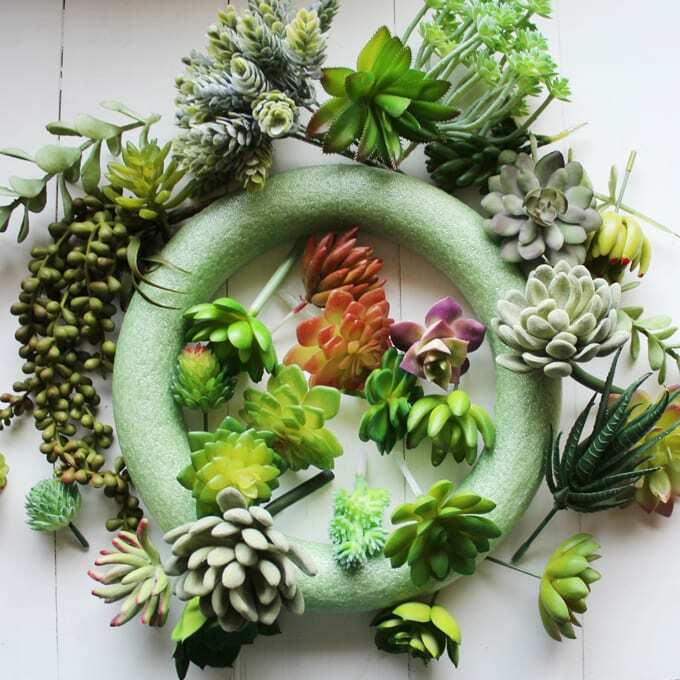 Create a gorgeous succulent wreath using faux succulents that really make a statement! 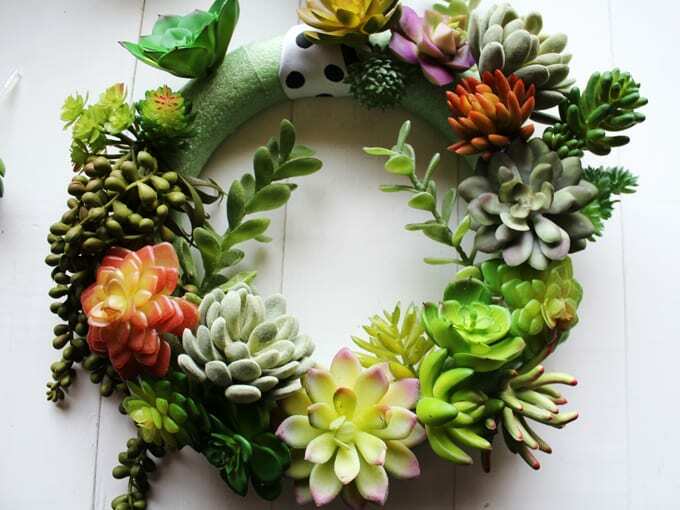 This stunning Succulent Wreath has a variety of colors and textures thanks to the faux succulents used. 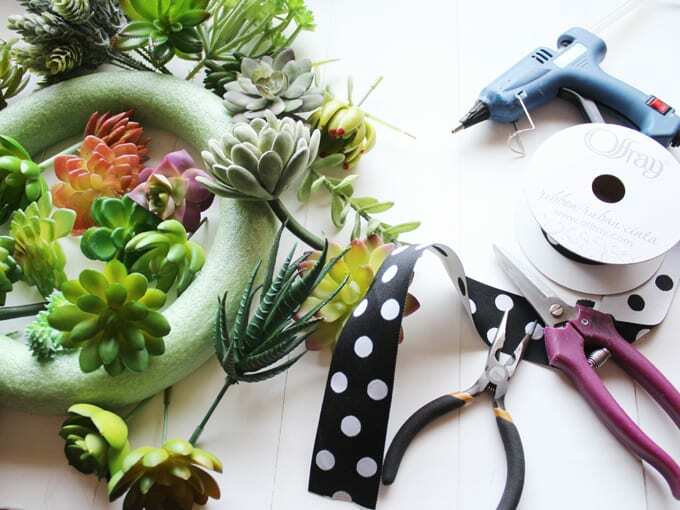 Hi friends, it’s Natalie from Doodlecraft sharing an easy-to-make faux succulent wreath perfect for Spring. 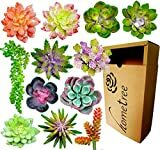 Succulents are uniquely beautiful decor and making a wreath is simple. 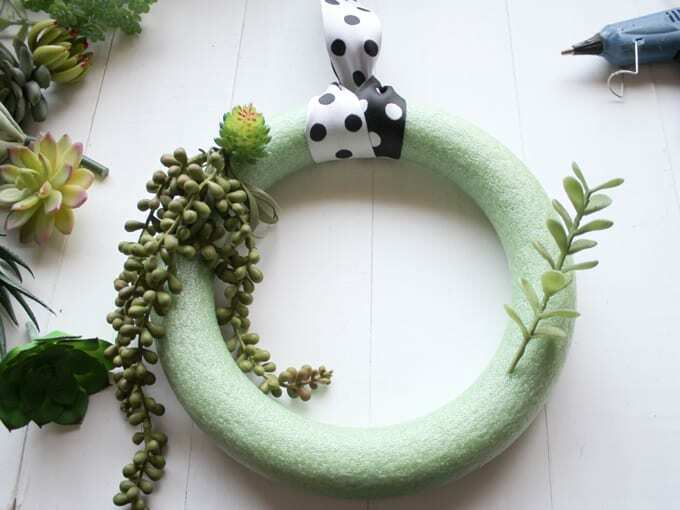 Create this especially stunning wreath in less than an hour by following this DIY tutorial. Gather all your materials on a large level work space. 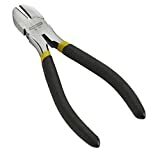 Be sure to take care when using the glue gun. 1. 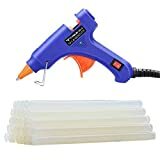 Begin by heating up the hot glue gun. 2. Next, cut a piece of ribbon about 2 feet long and hot glue the ends together to form one loop. This will be used to hang the succulent wreath. 3. 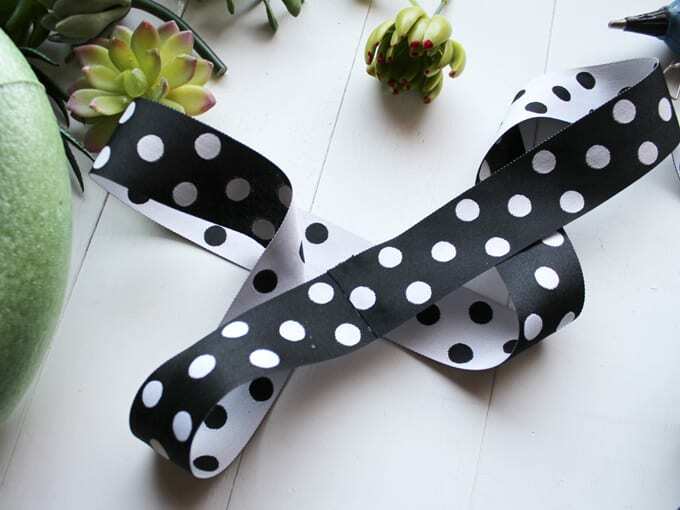 Simply loop the ribbon around the wreath and tie in a larks head knot. 4. 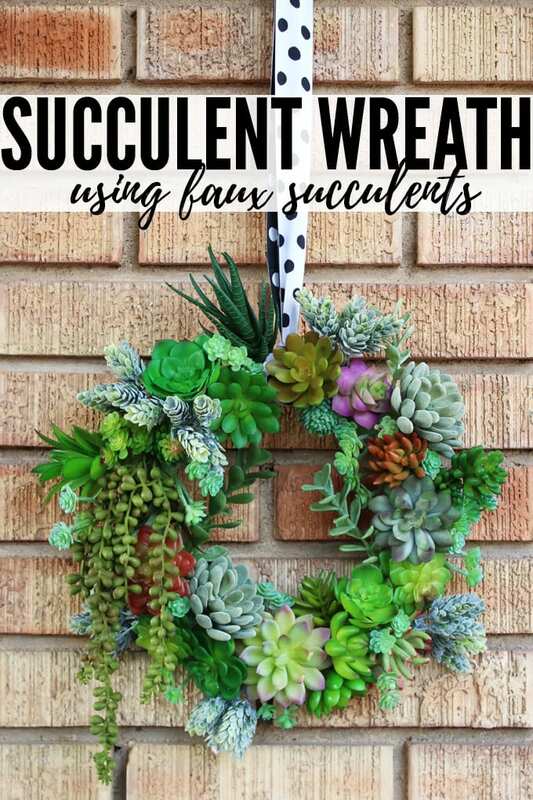 Then fill the wreath with faux succulents. 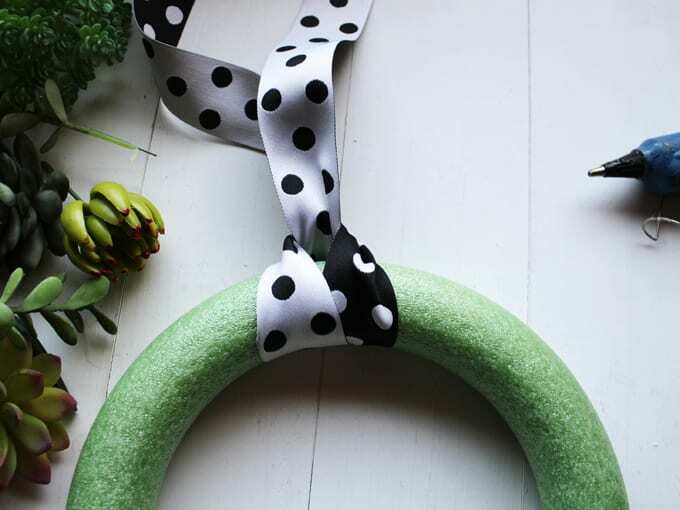 Hot glue them in place and pierce them into the foam wreath form. Let the string of pearls dangle down the wreath. 5. 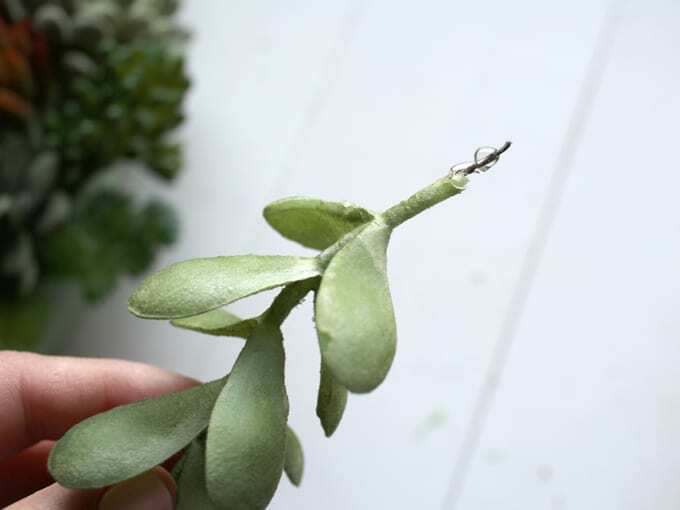 As pictured below, add some hot glue to the wire end of a succulent and poke it into the wreath. 6. Next, continue hot gluing and adhering the succulents to the wreath. 7. Trim the excess wire with the pruning scissors or wire cutters so the wires do not poke through the wreath form. PRO TIP: The succulents hold in pretty tight just in the foam, but add that hot glue for extra assurance. 8. 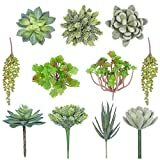 Continue to fill the succulent wreath with faux plants, divvying out the colors to spread them all over the wreath. 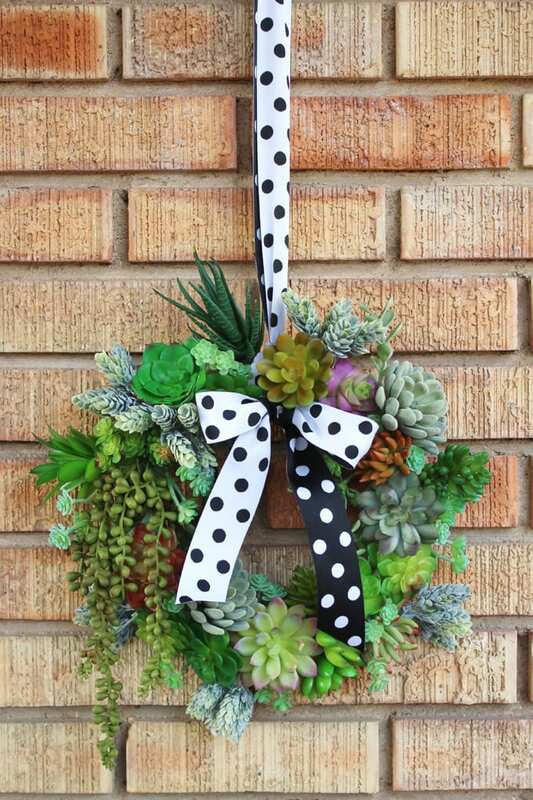 Choose the succulents placing so they frame and outline the wreath. 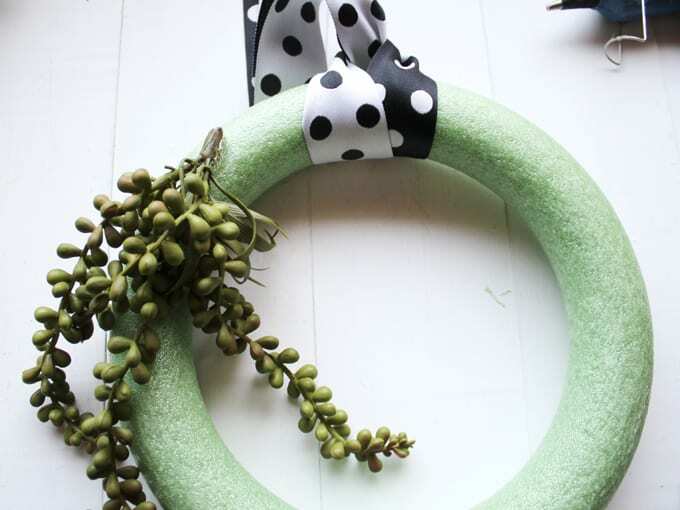 The green wreath form is a blessing to disguise any empty spaces. 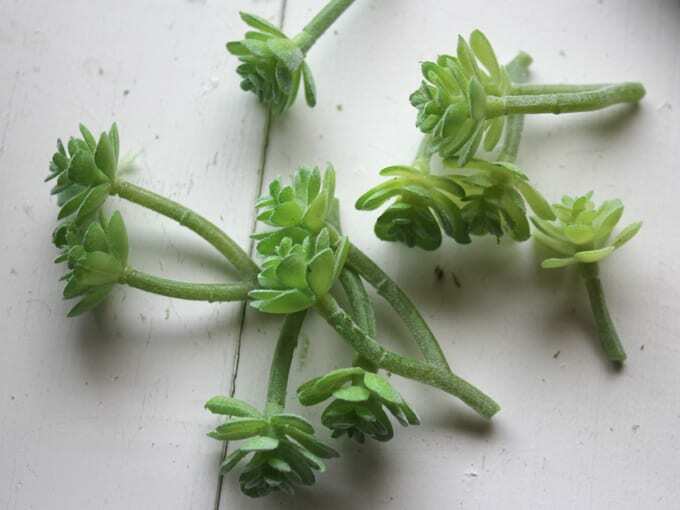 So make the succulent wreath full, use bigger succulents, like this one below, and cut it into smaller pieces. 9. Then use these smaller pieces as filler on the wreath to cover any open or empty spaces. It’s simply stunning! 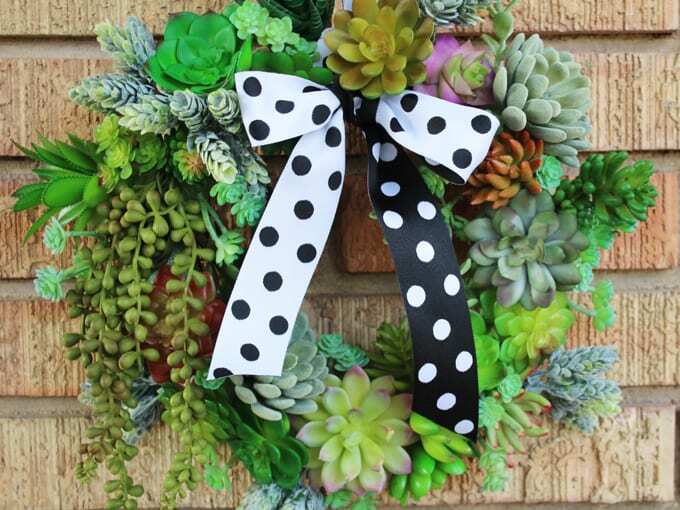 Use this succulent wreath to welcome Spring on the front door. 10. 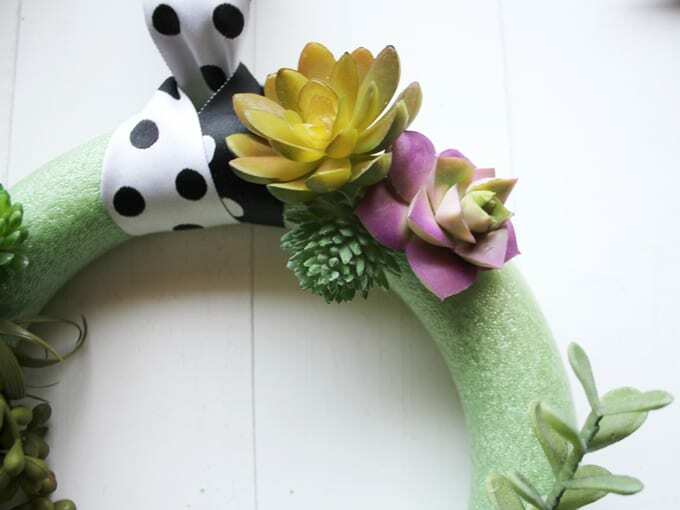 Add a big bow right in the center of the succulent wreath or leave it open and admire the greenery. 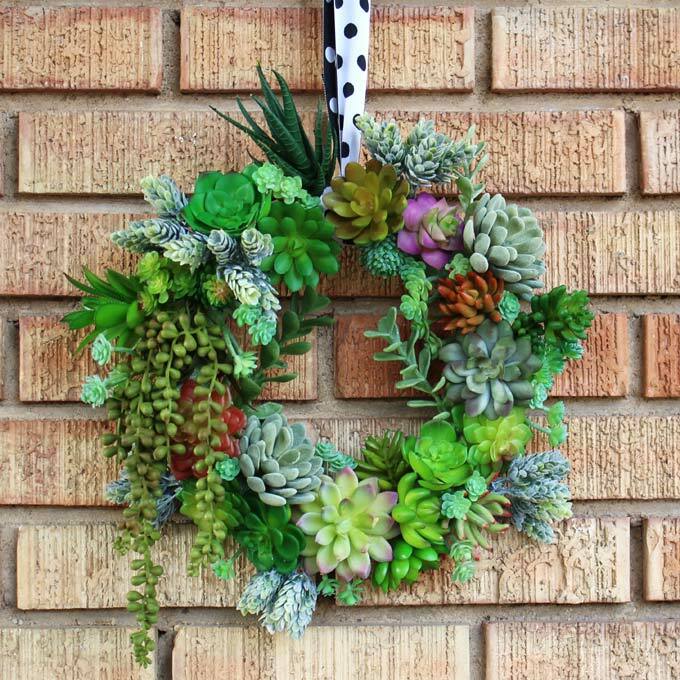 Succulents are so trendy now, but if you don’t have a green thumb, don’t worry because this Succulent Wreath uses faux plants! 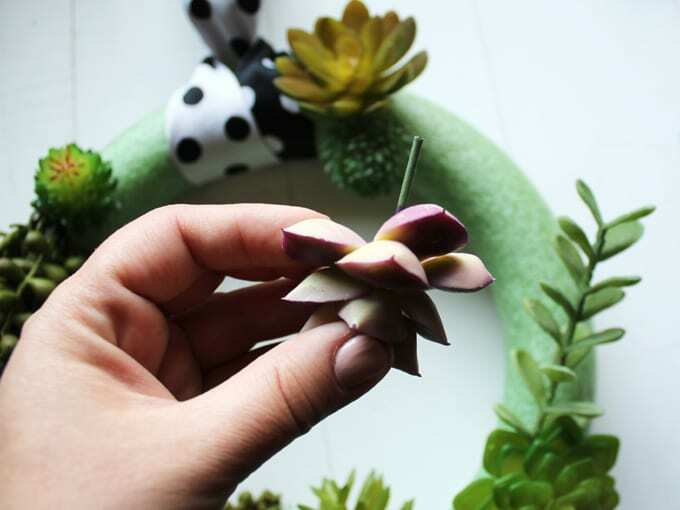 This beautiful DIY Succulent Wreath is made with realistic-looking faux succulents. Begin by heating up the hot glue gun. Next, cut a piece of ribbon about 2 feet long and hot glue the ends together to form one loop. Simply loop the ribbon around the wreath and tie in a larks head knot. Then fill the wreath with faux succulents. Hot glue them in place and pierce them into the foam wreath form. Let the string of pearls dangle down the wreath. 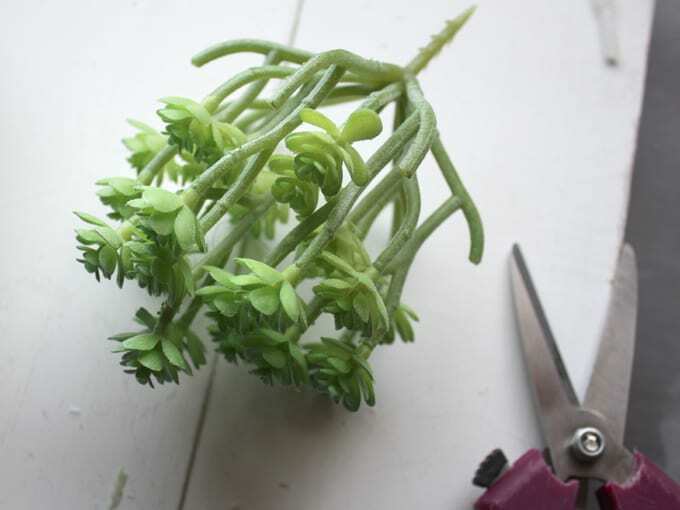 As pictured below, add some hot glue to the wire end of a succulent and poke it into the wreath. Next, continue hot gluing and adhering the succulents to the wreath. Trim the excess wire with the pruning scissors or wire cutters so the wires do not poke through the wreath form. 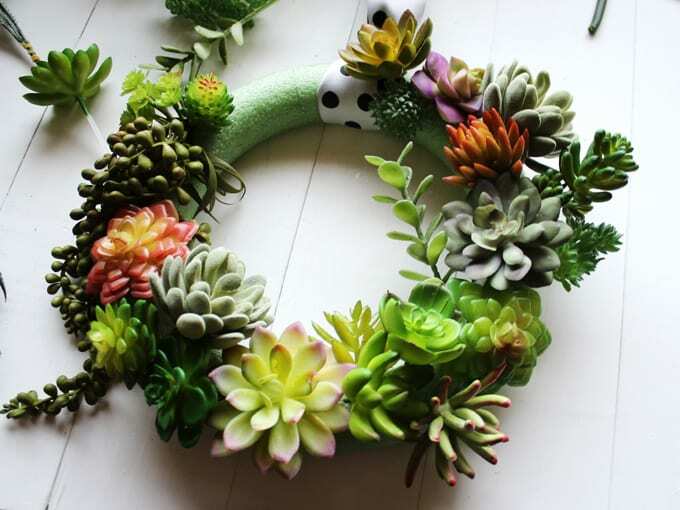 Continue to fill the wreath with succulents, divvying out the colors to spread them all over the wreath. Then use these smaller pieces as filler on the wreath to cover any open or empty spaces. Add a big bow right in the center or leave it open and admire the greenery. Ang, I absolutely LOVE this wreath!! Pinning!!!! Natalie did a beautiful job, didn’t she? Thanks so much for taking the time to pin and comment, Trish!